With Halloween out of the way, we’re already focused on all things festive! Yes, that’s right – we’re counting down the days until Christmas with joy, and we’re just about keeping on top of all of our holiday-themed crafting. If you’ve still got lots of handmade Christmas cards on your to-make list, why not download our festive paper pack to give you a helping hand? You’re guaranteed to find lots of inspiration in these beautiful designs, featuring cute colours and adorable festive patterns. 1.Cut a piece of grey board to 2.5” x 3” and cover with a design from the free papers. We chose the super cute snowman design. 2. Stamp the words ‘Santa’s Magic Key’ onto a piece of white cardstock and die cut with the nesting die set. Adhere to the tag. 3. Use the hole punch to make a hole in the corner. 4. Add the bells to the key using twine, and tie these to the corner through the punched hole. Tie into a bow. 5. Adhere Dovecraft ribbon to the back, then cover the back of the tag with backing paper to ensure that the grey board is hidden. 6. Finish off by adding the embellishments. This cute festive decoration can now be hung on the tree, added to gifts as a stylish tag, or used as a decoration elsewhere in your home! Or why not try this idea? These quick gift boxes are perfect for storing sweet treats and can be put together in just a few simple folds! Why not tie with a length of twine for an extra special finish, too? 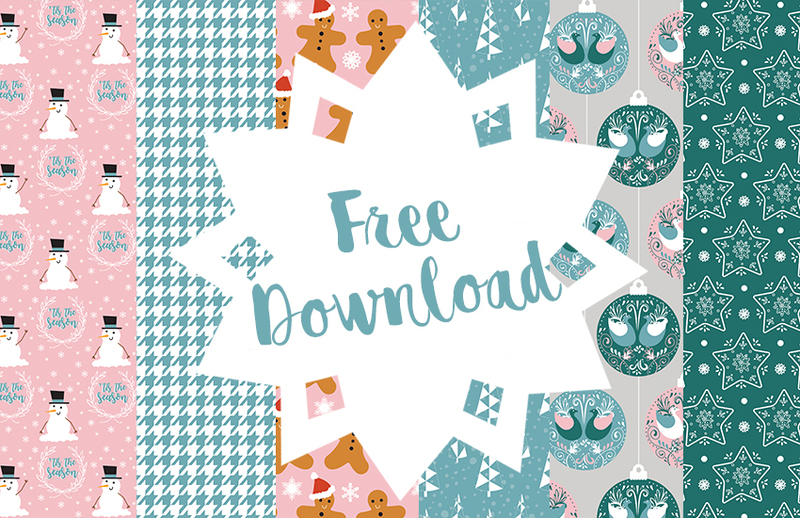 How will you use our free Festive paper download? We’d love to see so don’t forget to #Trimcraft when uploading to social media and to share your makes in the Inspiration Area. Such awesome ideas here, thanks sooo much for sharing them and aaaalso for the fab free papers you give us each month too.